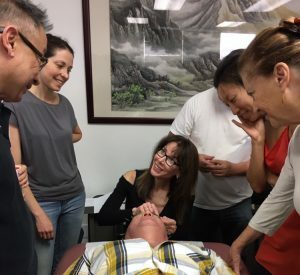 Taught by Michelle Gellis AP LAc DiplAc Instructor, MD University of Integrative Health, this is a Facial Rejuvenation Acupuncture and Facial Cupping / Gua Sha class for American Acupuncture Council. This comprehensive, live, three-day CEU class covers Facial Rejuvenation Acupuncture Theory and Acupuncture Needling Techniques and Protocols for Cosmetic Acupuncture. Hands-on skills such as submuscular and intradermal needling and techniques for needling the scalp, face and body points are practiced in a small class setting. Hands on Facial cupping, Facial Gua Sha and AcuLifttm Micro-needle Dermal Roller training are part of class. This class qualifies for 21.5 NCCAOM PDA CEU credits, 21 CA & FL CEU Credits. All materials needed for class are included. The skills taught in this class will be immediately applicable in your practice. Save $50 if you register by the early bird date. Early bird registration cut off dates are different for each class, please see class registration form for details. Unlicensed Students: Use coupon code “student50” when registering, and get $50 off the price of the class.